Surges of protests against a deeply unpopular government have catapulted Venezuela from back-burner regional crisis to a hemispheric one. It’s only a Russian presidential visit away from becoming the world’s next geopolitical hot spot. Medical supplies are running short, opposition leaders are calling for nationwide boycotts, and now the Americans are rousing themselves to begin a sanctions regime against the beleaguered Maduro government. It’s quite the fall from grace. From 2004 until 2013, Venezuela’s economy rocketed upwards, bringing a measure of prosperity to a country long accustomed to hardship. It appeared, in those heady days, that Hugo Chavez, the country’s authoritarian ruler, could bring about his socialist Bolivarian Revolution and economic prosperity. For the Latin American Left, Venezuela was proof that one did not have to conform to the neoliberal capitalism of the United States to be successful. Alas, since 2013, the economy has slid further and further, while inflation has hammered the country’s currency to the point of worthlessness. With America now poking its nose directly into Venezuelan affairs, with the opposition building a shadow government, and with the Russians trying to shore up Maduro’s government through increasingly generous aid shipments, the country has all the ingredients of a major geopolitical crisis. The Americans could find themselves sucked into an ever-expanding role in managing the Maduro regime; the opposition could give up on peaceful politics altogether and embark on an armed struggle; an opportunistic Vladimir Putin might wedge Russian power into South America in hopes of throwing the Americans off balance in Europe. Let’s take a few steps back first, however. The constraints of being Venezuela: hyper-urban, oil-dependent, and too close to the United States. 89% of Venezuelans live in cities, reducing the ability of elites to exploit a rural-city divide. Instead, Venezuelan elites try to navigate the complex urban political landscape by doling out the country’s oil receipts to their backers. For much of the 20th century, Venezuelan elite have been split between civilians trying to hold onto democracy and military officers trying to overthrow it. Like so many oil-rich countries, Venezuela has become addicted to its own oil supply, with its economy riding high during boom times and crashing hard when prices slide down. Like many other oil-rich states, Venezuela could not help but use much of that wealth to build sizeable, but expensive, welfare states that are often the basis of any government’s power. Finally, and quite importantly, Venezuela’s proximity to the United States cannot be overstated. Since the Monroe Doctrine, anything that happens in Latin America perks Washington’s interest. The Americans have never been particularly fond of Maduro or Hugo Chavez, but have kept their distance from the situation as conflicts in Asia and the Middle East have consumed American power. Yet that is to mislead America’s ultimate interests: should Venezuela go from a domestic political struggle to an international one, we may hear echoes of the Cuban Missile Crisis. The United States, after all, cannot survive as a superpower if it loses command of its own hemisphere. Hugo Chavez was a classic Latin American caudillo, a macho strongman with a military background seeking an ever larger political hacienda. To achieve this, he combined just about every Latin American left-wing idea into an ideology now known as Chavismo – an unworkable, unsustainable socialism and internationalism with little regard for geopolitical reality. In that sense, Chavez was a lot like former Libyan dictator Muammar Qaddafi, who produced his Little Green Book, a mish-mash of communism, Islamism, and Qaddafi’s own political thoughts that left Libya virtually workable absent Qaddafi’s cult of personality. But Qaddafi had some 40 years to hollow out the Libyan state; Chavez took power in 1999, dying in 2014. Moreover, while Qaddafi took over from a barely functional monarchy, Chavez had a full-fledged democracy to undermine. Chavez’s bad ideas had much less time to survive. Revolutions tend only to work well in the long run when they allow flexibility. When they’re attached to a rigid ideology or, worse, a specific personality, they tend to burn out. Chavismo had political breath so long as high oil prices papered over its obvious inefficiencies; it also could survive with Chavez’s charisma rallying crowds to its slogans. But Chavez is dead, and oil is cheap. 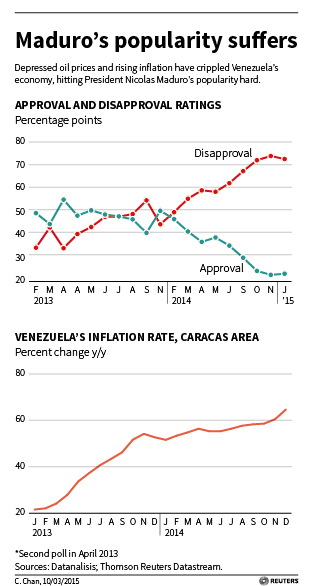 That was all it took to undo the shaky social contract of Venezuela. When Chavez died in 2014, Nicolas Maduro, his hapless vice president, was thrust into power with crashing oil prices and none of Chavez’s personality. Inflation skyrocketed, and predictably his poll numbers plummeted. Yet Maduro held fast to Chavismo as the solution to the country’s woe, which only increased the suffering within the country. Moribund democratic institutions began to stir against him. While Chavismo had stuffed the Supreme Court full of supporters and reworked the legislature to make it ever less harmful to the president, it had not dismantled opposition parties, the press, or the activists who now organize the streets. Not that Chavez didn’t want to, but 15 years was too short a time to fully dismantle a democracy with roots as deep as Venezuela’s. Now Maduro is hoping to take a step in that direction by rewriting the Constitution. Again much like Qaddafi, he hopes to rework the way the legislature is elected by creating an elaborate – and, in the long run, unworkable – system in which categories of people are giving slots in the legislature. Students, workers, farmers, and union members – traditional bedrocks of Latin American socialism as well as Chavismo – would have guaranteed seats. Naturally, Maduro’s government would assign people their chosen class, ensuring he could game the system in his favor as he saw fit. This isn’t all that unlike what Myanmar’s military did when it transitioned to democracy: it stuffed the legislature full of soldiers with guaranteed seats, ensuring the government always tilted towards the military while allowing for some opposition voices to be heard and to partially govern. But that worked because it was a step away from dictatorship, not towards it. The ongoing street protests have demonstrated that Venezuela’s citizens are not interested in sliding towards that kind of rule. Now what? A coup, a civil war, an intervention? Maduro and his clique seem intent on holding onto power no matter what. While there is an election in 2018, the way he is gearing the system implies he will find a way to either cheat the vote or tilt the balance in his favor. That leaves only a handful of options: coups, civil wars, or interventions. That the military could launch a coup seems barely in doubt. Yet it is under the command of Chavist generals, especially Vladimir Padrino López, who backed Hugo Chavez during a brief coup in 2002. That means a military-wide coup is unlikely, but there could be a replay of the 2002 coup, or even Chavez’s own 1992 coup attempt, when small groups of disaffected soldiers struck at the heart of the state. Yet such small-scale coups are risky: Turkey’s coup last year played that game and lost once news of the coup spread via social media to the rest of the still-loyal military. That leaves the anti-Maduro swarms with a more dangerous option: fighting something akin to a civil war. 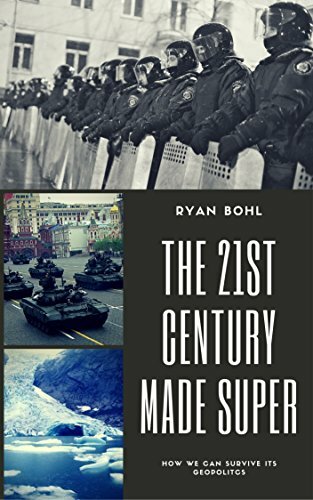 That seems likely to repeat Ukraine in 2012-13, where street battles around the centers of government spared the rest of the country much of the turmoil. They could also hope to split military units from the Chavismo command, which would then produce a more classic civil war. Once that Pandora’s Box is opened, however, it cannot be closed, and Maduro could try the Assad scorched earth card to survive. Finally, there is the risk – or opportunity, depending on who you are – of an intervention. The Organization of American States has been feckless during the crisis, and diplomacy seems unlikely to dislodge the Maduro regime. That leaves only those with hard power able to influence the country. The United States has now entered the fray, albeit gingerly, by imposing sanctions. Should the crisis continue, they will not be the last. That will force Maduro to scramble for outside allies, since Maduro seems convinced the United States intends to invade. And who else is there for Maduro to go to but Vladimir Putin? If Putin is seeking a grand bargain for Ukraine, Venezuela might be a decent chip to have in hand when he sits down with the Americans. Unlike Soviet days, where Moscow sought to crack American power in its hemispheric home, Putin would be unlikely to risk the kind of intervention he’s led in Syria, nor would he gamble on a repeat of the Cuban Missile Crisis. Instead, he could provide life support for the Maduro regime and once more weaponize a crisis against the West. Unrest or a civil war could create a new flood of refugees that would provide plenty of headaches for both the Americans and their Latin American allies. That sort of distraction would serve Putin well – a crisis in the American home could give him maneuvering room in his own backyard. Yet Putin cannot produce a civil war or a refugee crisis, only worsen them. He must wait on Venezuelans themselves before he can act. That Venezuela has fuel for a fire is without a doubt. The question is, what will spark the fire, and who will try to benefit from it? See the July issue, check the Latin America section. Havana has gotten a lot of freebies from Caracas since Chavez took power. If Maduro goes, what happens to these? Yet does Cuba have the power to be anything but a bystander? Though I agree that too is worth watching. Well, this depends on your willingness to dig into the Cuban-Venezuelan relationship. I’m sure you’ll find, at the very least, circumstantial evidence that both regimes have been propping each other up for years. Interesting take on a Putin gambit. Also very logical and believable. With the current US administration it would likely work given Trump’s ability and leadership style. Another poker in this fire is the insane level of Chinese investment and debt load incurred by the Chavez-Maduro gov’ts. If Maduro goes, what happens to these? But given the “russian spy” hysteria in D.C. and the claims that Trump is not doing enough against Putin. Would an open russian involvement not increase the likeness for an american intervention? It would were it military intervention. But Russia could use cash, training, food/medicine, or even arms to build influence there. That wouldn’t necessarily provoke a quick American reaction so long as it appeared to be subtle.